We love sharing! Use this page to download any of the free resources we've put together for leading groups, teaching creativity and confidence, and more! To download a resource, you will be asked to provide your e-mail address and the download will be available immediately. You'll also get a quick little e-mail from our friends at MailChimp, asking if you'd like to receive our newsletter. We hope you'll say yes!! Experience the Girls With Ideas curriculum for free! This is a download of one of our most popular lessons: Lesson 5 — Leadership Styles In Action. It's straight out of our curriculum so you can see how our lessons are laid out and get a feel for how we do it! This lesson encourages the girls to utilize their leadership strenghts by using unconventional materials to put on a fashion photo shoot! Thank you! CLICK HERE to download the Girls With Ideas Free Leadership Lesson! Sometimes your idea might need a little funding to help make it happen! In this interactive PDF file, we've put together a list of fundraising ideas, services, and websites that will help you get the funding you need! This list is always growing, so please contact us if you want to share a helpful resource you use. Thank you! CLICK HERE to download the Girls With Ideas Fundraising Resources guide! One of the biggest challenges of having an idea is letting people know about it. Girls With Ideas has curated a list of resources that will help you market your idea. Have you used a cool marketing tool to promote your idea? Please contact us and we'll add it to the list! Thank you! CLICK HERE to download the Girls With Ideas Marketing Resources guide! Icebreakers are activities that help start a conversation between group members. They are a great way to engage the girls in your group to help them to get to know each other better and have a shared experience. Here is a list of some of our favorites that are super simple! Thank you! CLICK HERE to download the Girls With Ideas Icebreaker Ideas! When you are working with a group of girls, there are times when you have a few minutes to fill at the start or end of the group. Here are some of the fun teambuilding activities to fill the time that are fun and easy to do! Thank you! CLICK HERE to download the Girls With Ideas Team Builders! Own it, girl! This instant digital download is a girl's reminder that she has the strength, power, and smarts to own her world! Printable art is the easy and affordable way to personalize your space in a way that inspires you. You can print at home or at your favorite print shop! Thank you! 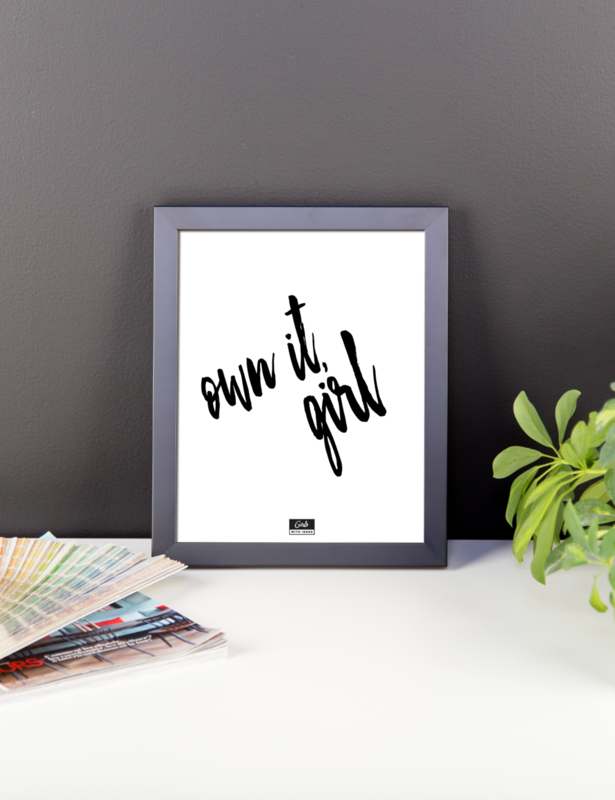 CLICK HERE to download the Girls With Ideas 'Own It Girl' print! Hustle and heart will set you apart. This instant digital download reminds us to work hard and do it with passion! Printable art is the easy and affordable way to personalize your space in way that inspires you. You can print at home or at your favorite print shop! Thank you! 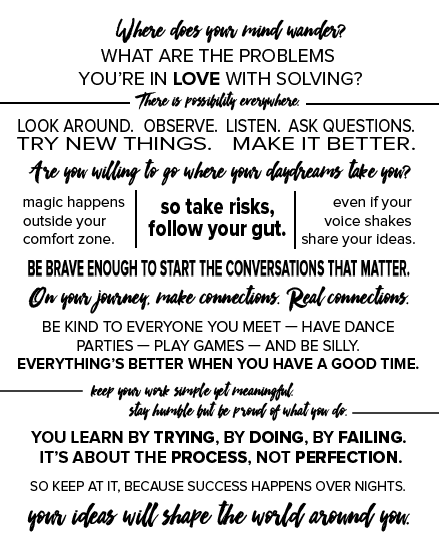 CLICK HERE to download the Girls With Ideas 'Hustle and Heart' print! We wrote our vision statement to inspire girls around the world to strive for their goals, just like we did! This 8 x 10 print is super motivating and visual reminder to strive to be generously kind, wildly creative, and powerfully confident. You can print at home or at your favorite print shop! Thank you! CLICK HERE to download the Girls With Ideas Vision Statement print! You can take the quiz online HERE or download it below for a PDF version! Thank you! CLICK HERE to download the Girls With Ideas Leadership Style Quiz! We love to have dance parties while we work! However, we know it can difficult to find fun and appropriate songs to play when working with girls. So we made a playlist with songs that you can use! We are always editing the list and add more, so be sure to follow us on your Spotify account! Thank you! CLICK HERE to go to the Girls With Ideas Spotify Playlist! This tutorial shows you how to make a website (no coding required) using the Strikingly platform. Girls With Ideas is not affiliated with Strikingly, we just believe that their platform is user-friendly for kids and produces beautiful websites!